I recently had the pleasure of creating the branding and marketing collateral for the new initative of the Young Businessmen of Tulsa (YBT). 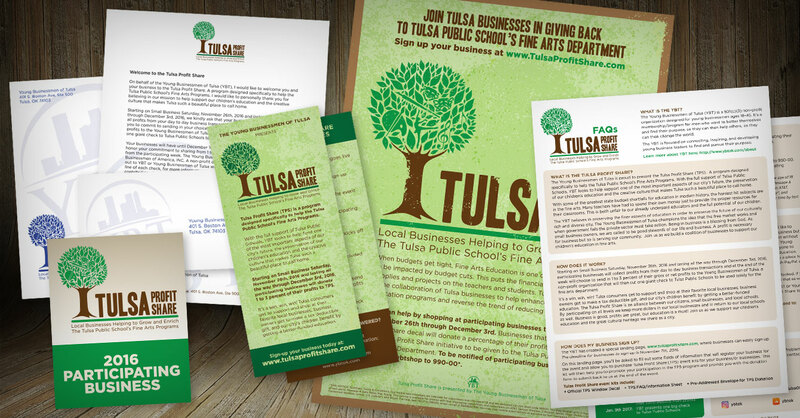 Tulsa Profit Share was designed specifically to help the Tulsa Public Schools Fine Arts Program. YBT believes in preserving the finer aspects of education in order to preserve the future of our culturally rich and diverse city. They started the Tulsa Profit Share program to give Tulsa area businesses a way to put action to that belief. To get their project from an idea to reality they asked me to create a logo that would visually represent their desire to help grow the Fine Arts Program in Tulsa Public Schools. After working through a few variations we settled on the Tree with the different programs represented in the leaves. From there I was able to put together a complete marketing package that they could use to advertise the program to area businesses and a welcome packet that included a poster and window cling for the business to advertise their involvement in the Tulsa Profit Share program. If you want to learn more about the Tulsa Profit Share program, you can visit them online at www.tulsaprofitshare.com. Quality Web Design, Graphic Design and Branding Services. Freelance or Full-time. © 2015 - 2019 Tom Jestus.